To meet the high demand of sector specific job oriented professional programs, Pondicherry University was entered the field of Distance Education in the academic year 1995 – 96. Pondicherry University Distance Education Wing focuses only on MBA Programmes. More specifically, sectoral MBA Programmes. In our today's post, we're going to write about various distance education courses offered by Pondicherry University, There admission criteria & fee structure. As we've mentioned above, The University focuses on job oriented sectoral MBA programs. The name of the programs offered by the University are as follows. The Directorate also offers the 3 year MCA program. However, MCA Programme is offered only at the Twinning Programme Institutions (TPIs). All the Programmes offered by Pondicherry University are approved by the Joint Committee of DEC, AICTE & UGC. The minimum duration for completion of the MBA course shall be two years and the maximum period shall be four years. 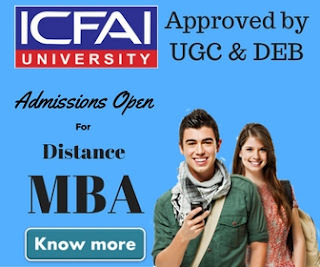 A Degree from a recognized University under 10+2+3 or 11+1+3 or 11+2+2 system is required to be eligibile for the various distance learning MBA courses offered by the university. The simplest way to get the admission is to download the application form from the University website and send it to the Director, DDE with all the required enclosures. Spot Admission facility is also available which helps the candidates to seek provisional admission at the authorized SPOT ADMISSION CENTRE by the DDE, Pondicherry University by paying the requisite fees and getting the original documents verified and returned to the candidate then and there, rather than sending the original certificates to the Directorate. For more information about the Spot Admission, candidate may visit http://www.pondiuni.edu.in/content/spot-admission. Candidate awaiting for final year UG Course results may also apply for the admission. Defense personnel serving in Indian Armed Forces. Personal Contact Programme (PCP) classes will be arranged at the centers allotted by the Directorate subject to the strength of the students. Students will be informed about the same in advance. Although to attend the classes are not mandatory but it's recommended to attend the classes to get the full benefit of the MBA program. A candidate may download the revised syllabus for MBA programs from the following links. For more information we advise to all students seeking admissions in Pondicherry University Distance education courses to visit the university official website i.e http://www.pondiuni.edu.in/content/distance-education. 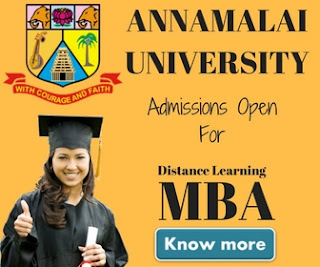 We had also published a post on Pondicherry University Distance MBA courses in past, students may also refer the post for some information.